Attend an Oscar-viewing party in the very spot where the ceremony was first held. Attend an Oscar-viewing party in the very ballroom where the ceremony was first held in 1929. YOU HAVE THE SNACKS... on the coffee table, and the beverages lined up just so, and your paper ballots are fanned out on the kitchen counter. You are, in short, ready for the Academy Awards, and the friends sitting on your couch are eager to see if their picks for cinematography or costumes are inside those fabled envelopes. You can almost pretend, for a moment, that you're all attending the Oscars, but, alas; somehow, this year, it wasn't to be. But what could be, if you want to be a bit splashy, and glittery, and find your inner hand-waver (the kind of inner hand-waver who waves so serenely to a stand of enthusiastic fans), there is a way to watch moviedom's biggest night in not just an lore-filled location, but, perhaps, one of the ultimate lore-lovely spots. BEHIND THE VELVET ROPE PACKAGE... and find your way to the Blossom Ballroom to watch the 89th annual Academy Awards on Sunday, Feb. 26. You'll also spend two nights in a Studio King Suite, in case all of the excitement you experience while awaiting your favorite category to be announced tuckers you right out. There's a Red Carpet Rituals package, too, which includes the Blossom Ballroom viewing party in addition to an "in-suite make-up" session from The Glam Squad and some lovely hair color from celebrity stylist Lenny Strand of Sally Hershberger (plus the two nights in the Studio King Suite). ONE MORE PACKAGE... on the 2017 line-up includes those fancy-pants things, less the viewing party, in case you've got your own bash to attend (it's called the Award Season Is Upon Us package). 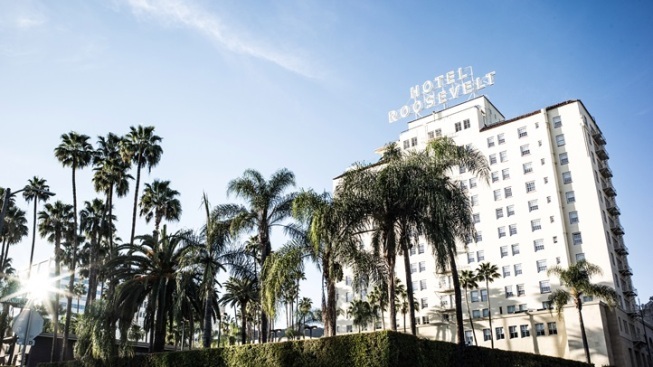 For all of your glam'd-out, get gussied-up options, the prices, and general Tinseltown history (history that's rooted oh-so-deeply at The Roosevelt), start here or give the Hollywood Boulevard a jingle on the telephone.